Although Charity Navigator rates more organizations than anyone else in America has ever attempted, we still receive requests to rate additional charities. The truth is that we've already evaluated the majority of the organizations that meet our criteria, but we do realize there are many worthy organizations that we do not currently evaluate. That’s why we’ve created this quick guide to help donors do their own due diligence on the charities seeking their support. While there are many more factors that go into a complete Charity Navigator evaluation (see our Methodology), we’ve pulled some simple, easy-to-find facts that will help you decide which charities deserve your contributions. Charities are required to submit an annual Form 990 with the IRS. This document provides information about a charity's finances and governance practices. 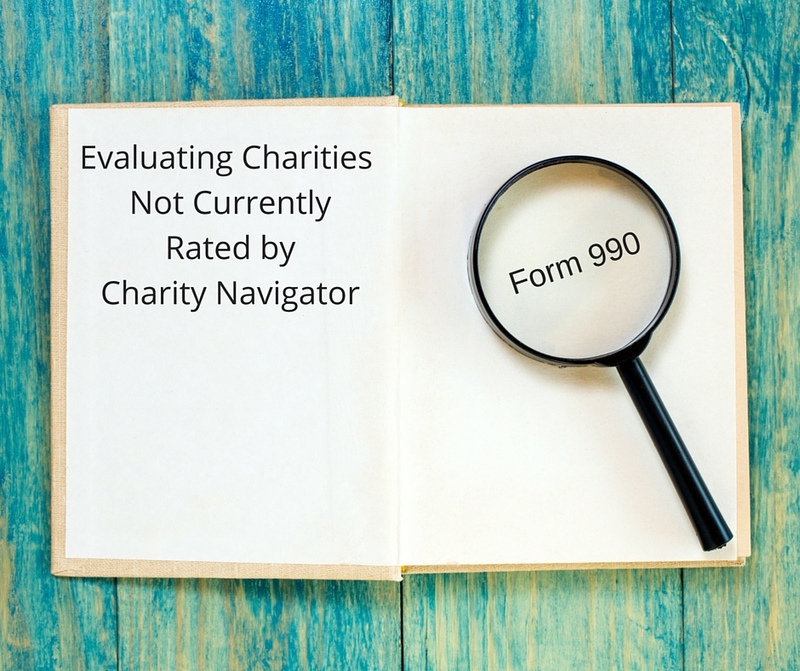 This guide to evaluating charities not currently rated by us uses the Form 990 (just as we do in our complete evaluations) to review certain elements of a charity’s performance. So, the first thing you need to do is to locate the charity's profile page on our site and scroll to the bottom of the page. There you'll see links to the charity's Form 990 (you will need to complete a free registration process and log into the site for the links to function). Simply click on the charity's most recently filed Form 990 and keep it open while you follow the steps below. Program Expenses: The majority of charities listed on our site - seven out of ten non profits - spend at least 75% of their expenses directly on their programs. That means the organization should spend no more than 25% of their total expenses on administrative overhead and fundraising costs combined. To determine the percentage going to programs for the charity you are reviewing, scroll to page 10 (Statement of Functional Expenses), find Line 25 (total functional expenses). Divide column B (program services) by column A (total expenses) then multiply by 100. The resulting figure is the percentage that organization is spending directly on their programs and services. For a more detailed break out of the program expenses, review the "Statement of Program Service Accomplishments" located on Page 2, Part III. Growth of Program Expenses: Determine if the charity you are considering supporting is expanding or shrinking over time. You can quickly do this by comparing the Total Program Expenses- page 10, line 25B of the current year with the prior year(s). While the growth doesn't need to be dramatic, charities that are shrinking are very likely cutting the very programs that you want to support. Types of Support: Take a look at lines 1a through 1g (on page 9, "Statement of Revenue") to learn about a charity's funding sources. Some charities rely heavily on membership dues (line 1b), or government support (line 1e) while others survive almost solely on individual contributions and fundraisers (line 1f; 1c) and still others depend on program service revenue (line 2g). Having multiple sources of revenue can be beneficial for a charity. For example, if an organization experiences a drop in donations from individuals, then it can draw from other revenue sources to sustain its programs. If a charity has no revenue listed on line 1f, then it may not even be prepared to accept private contributions. Executive Pay: Our research shows that the average CEO compensation is in the low to mid six figures among the charities that we rate. On page 7 of the Form 990 (Compensation of Officers, Directors, etc.) organizations are required to report the CEO's pay and any current officers making over $100,000 annually. As you examine salaries, keep in mind that a variety of factors impact pay including geographic location, size of the organization, and type of work performed. Professional Fundraisers: You can determine if a charity uses professional fundraisers by examining the charity's Form 990 in Part I, line 16a, column b and in Schedule G (which offers a more detailed breakdown). Use of professional fundraisers in and of itself is not necessarily a bad thing. Professional fundraisers can be more efficient and effective at raising funds for the charity than staff or volunteers would be and some of the costs spent on these third party companies are funds that would also have to be spent on staff, equipment, and technology if the campaign were entirely managed in-house as well. However, if the charity is spending a lot on outside fundraising firms with little going towards its charitable mission, then you may want to look for another charity to support. For more information on this topic, see our tips for What To Do When A Charity Calls and our Top 10 list of Charities Overpaying their For-Profit Fundraisers. Fundraising Costs Allocated to Program Costs: Joint costs, reported in Part IX, line 26, refer to activities that combine educational campaigns with fundraising. For example, a direct mailing’s primary purpose may be fundraising but there may also be a portion of the mailing dedicated to public education, such as a public safety organization printing tips to prevent crime in your neighborhood. Not all nonprofits that engage in advocacy, education and awareness choose to use this accounting methodology, which requires substantial documentation and impact on audited financials varies depending on the charity’s activities. Charity Navigator strongly encourages nonprofits that use joint cost allocation of public education and fundraising costs to be very transparent in this accounting application. You can see the amount of joint costs that are included in a nonprofit's program expenses by reviewing page 10 line 26B. Website: The best charities are transparent and accountable to the public. You should be able to see evidence of this in the information they provide on their web site. Can you readily find information about the charity's staff and Board of Directors? Did the charity publish its financial information such as its most recently filed Form 990 or audit? Read the news: Check the charity's recent media coverage through Google news or another similar service. Form 990: Look at pages 3-6 to see if the charity is committed to best practices. For example, does it have a conflict of interest policy? Does it have a whistleblower policy? Does it have a process for setting the CEO's pay? Use our recommended list of questions to learn about a charity's accomplishments, goals and challenges by reviewing its website and/or talking with staff. They should be able to tell you about the quality and depth of their results as well as their capacity to continue to get these results, not just the number of activities or people served. This is critical step, after all, the charity's ability to bring about long lasting and meaningful change in the lives of people and communities should be the key reason for your financial investment. We hope this guide will help you make informed giving decisions about charities that we don't currently rate. Remember a true Charity Navigator evaluation considers many additional factors when completing a rating. By doing your homework and following this step-by-step guide you can make informed choices about your philanthropic endeavors.